Is it fair to say that a talented printmaker’s most visible work takes up one side of an old grocery store? Yes, if that print-maker is Linda Taylor who spent many months restoring the mural on the exterior wall of Jonathan’s at Peirano’s, a historic brick building in Ventura, California. Her artistry in printmaking was recognized by the Museum of Ventura County when she was named first Artist in Residence. Printmaking is at the center of Taylor’s artistic life and has been since her student days at San Diego State University where she took a print-making class. “It was love at first sight!” She employs all types of print techniques, either alone or in combination, creating works in a semi-abstract figurative mode with an emphasis on color, texture and line. 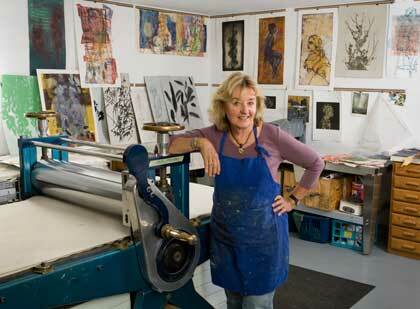 She is known for bringing world class printers to workshops held in her studio. Taylor is deeply involved in her community, having been a teacher and having served on the Ojai School Board, work that cuts into her gardening efforts. She is a member of Rotary and has been active in Rotary’s fight to eradicate polio. Linda Taylor’s documentation took place in 2009 and was sponsored by Richard and Yvette Franklin. The FOTM Archive contains extensive information about this artist.